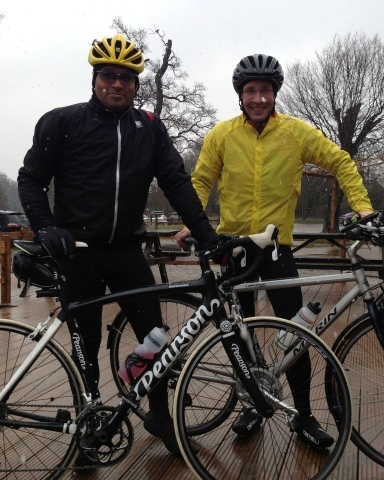 Bike4Good : London-Paris in 24 hrs for Duchenne Children's Trust : Why does it always snow on me? Why does it always snow on me? Newhaven training ride cancelled due to the terrible weather and all I felt was guilt. So when Dan Brooke kept insisting on braving the snow I couldn't say no. That and my wife accusing me of "wimping out". It was cold, wet, snowing and my goggles kept steaming up so I couldn't see. But we managed 3 laps of Richmond Park - enough to feel a bit virtuous. But my feet were soaking when I got home despite supposedly waterproof overshoes, and I have an inexplicable break in the skin of my right knee, which I can only assume is due to pedalling so hard. That's my story anyway. Not much better this morning. Horizontal snow! Will's coffee never tasted so good. Here's hoping we get paid back with sun all the way to the Eiffel Tower!